You should not take birth control pills if you have any of the following conditions: uncontrolled high blood pressure, heart disease, a blood-clotting disorder, circulation problems, diabetic problems with your eyes or kidneys, unusual vaginal bleeding, liver disease, liver cancer, severe migraine headaches, if you smoke and are over 35, or if you have ever had breast or uterine cancer, jaundice caused by birth control pills, a heart attack, a stroke, or a blood clot. 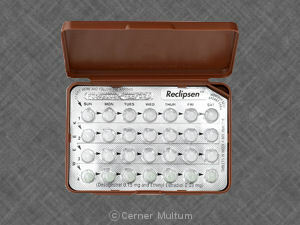 The 28-day-birth control pack contains seven "reminder" pills to keep you on your regular cycle. Your period will usually begin while you are using these reminder pills. Many drugs can interact with birth control pills and make them less effective, which may result in pregnancy. Ethinyl estradiol can also affect blood levels of certain other drugs, making them less effective or increasing side effects. This includes prescription and over-the-counter medicines, vitamins, and herbal products. Tell each of your health care providers about all medicines you use now and any medicine you start or stop using. Copyright 1996-2017 Cerner Multum, Inc. Version: 8.01. Revision date: 2/29/2016.